After a delay because of player involvement in Slaughtneil’s All-Ireland bid, the MacRory Cup St.Patricks quarter-final clash bewtween the Academy and Maghera is on Wednesday night. The Dungannon coach Kevin Collins has had a long time involvement with the school’s teams through the years. Although happy with his team’s performance in the last round, both he and the management team of Peter Herron and Ciaran Gourley know the focus is always on the game at hand. “We played some very good football against Magherafelt, and perhaps surprised ourselves at how comfortably we won. But that game is confined to history now, and we can only concentrate on the game with Maghera. The sides met in the group stage and it was 3-8 to 0-8 the holders. They would go on to have an indifferent league campaign, heavily defeated by Omagh CBS. Similarly Dungannon failed to light up the early stages of the competition, but did enough to progress and now find themselves three games away from securing their first MacRory Cup since 2009. “Before Christmas we were deservedly beaten, because we didn’t play at our best” admits Collins. “This time around, anything but our best won’t be good enough. “Any team in the competition at this stage has to have aspirations to win it, so it’s wide open. “All four quarter finals are sure to be good, tight games. “Only one thing that’s certain, is that a St Patrick’s’ team will be advancing to the semi final, whether they’re from Derry or Tyrone. 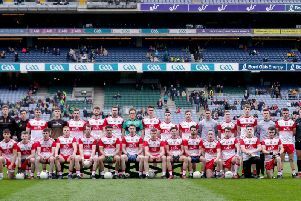 “Although I’m a Derry man myself, I’m hoping it’s the Tyrone team this time!” added Collins with an obvious bias that is quite understandable.